Lea, I love your card! Mr. Fox sure looks cozy with his hot cup of cocoa and little scarf! Love the snowflakes, the colors, the bling. Sigh! Just too cute! Thanks for playing along with us this week at Papercraft Star! Adorable card. Love the Fox with aharf. Such pretty colors!!! Love the look and feel of your card!! Lea I love your card!!! The fox is so cute. I love the way you fussy cut him and layered ove the doily! I'm so happy you played along with us this week at Papercraft Star! 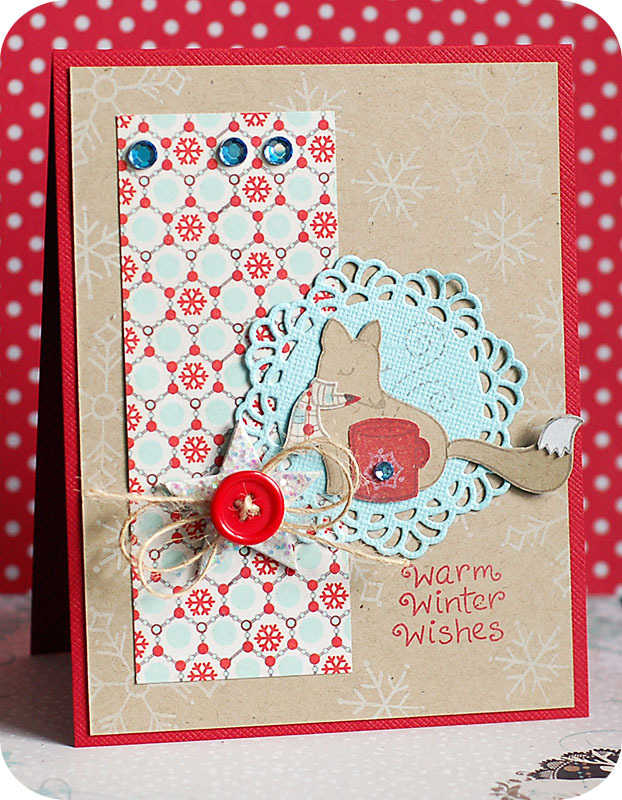 Lovely card, love your color scheme and your snowflakes! Beautiful colors and design Lea! The red and blue just pop with the white and kraft on this card Lea! It's such a cozy little card for the upcoming season. :-) So glad you joined us again this week at Papercraft Star! So sweet Lea! Love these colors for winter. Lea your cards are so unique... love your style! Such a cute card, thank you for sharing it. Such a cute card Lea!! Love the star embellishment, your colors and your use of the doily! Thanks for joining the ODBD Shining the Light challenge this week! This looks fab. I love the colour combo, it's fab! Thanks for joining us at Secret Crafters this week.